American sled-launched SSTO VTOVL orbital launch vehicle. Study 1966. 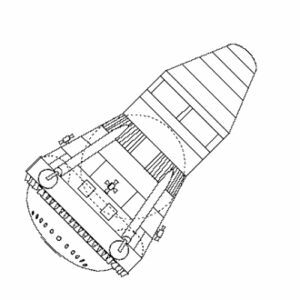 Yet another of Philip Bono's single-stage-to-orbit designs of the 1960's, using a plug-nozzle engine for ascent and as a re-entry heat shield. Hyperion would have taken 18,100 kg of payload or 110 passengers to orbit or on 45 minute flights to any point on earth. Hyperion used a sled for launch, which would have seriously hurt its utility. The sled gave a 300 m/s boost to the vehicle before it ascended to orbit. The sled would have 3 km of straight course, followed by 1 km up a mountainside, with a 3 G acceleration. Status: Study 1968. Payload: 18,100 kg (39,900 lb). Thrust: 6,160.00 kN (1,384,820 lbf). Gross mass: 470,000 kg (1,030,000 lb). Height: 31.00 m (101.00 ft). Diameter: 16.00 m (52.00 ft). Apogee: 185 km (114 mi). The aerospace transportation industry grew by leaps and bounds during the 1960s as bigger, faster and ever more capable aircraft and rockets became available. There appeared to be no limits to progress. In April 1963, NASA's Manned Spaceflight Center released a launch forecast for "Nova"-class heavy rockets in the 500-metric ton payload class. The expected need for such vehicles in 1975-90 included a 50-crew Moonbase (1975-), manned Mars flights (1981-), unmanned planetary craft (1979-), large space stations (1980-),and a "global transportation system" (1980) with 242 flights/year by 1990, and a "Nova military strike force" in 1976 (15 flights/year by 1981). Douglas Missile & Space Systems tried to capitalize on this by proposing a series of suborbital rockets capable of transporting 110-260 passengers at 25,000km/h. The "Hyperion" vehicle was truly remarkable since it would have been launched horizontally and landed vertically (HTVL) -- an extremely rare combination. The payload capability was 110 passengers or 18t of cargo. The takeoff mode was similar to contemporary HTHL TSTOs, i.e. a subsonic sled riding on a cushion of air. Hyperion would be travelling at 1100km/h as it left the sled at the end of the 3km launch rail. Unlike other Douglas SSTO concepts, Hyperion was fully reusable so it would have been ideally suited for flights from inland sites since no fuel tanks would be dropped during flight. The booster sled would literally have provided a "flying start" which greatly reduced the SSTO dry mass. 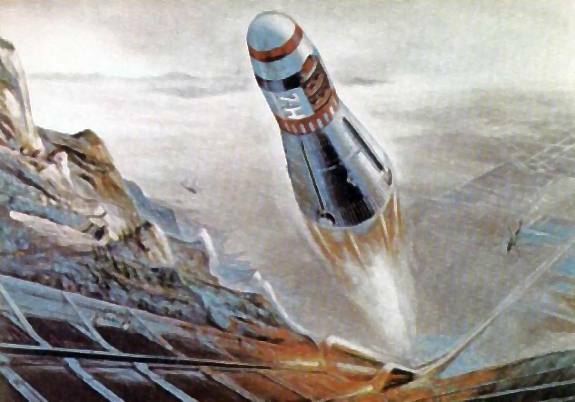 Unfortunately, the Hyperion launch system also required a 1.7km high mountain so Douglas mostly regarded the concept as an experimental vehicle. Douglas expected that the vehicle would cost $1.5 billion to develop (=$8 billion at 1999 economic conditions), and the cost per seat would have been $3000 -- or $15000-16000 in 1999. LEO Payload: 18,100 kg (39,900 lb) to a 185 km orbit at 28.00 degrees. Development Cost $: 1,500.000 million. Launch Price $: 0.330 million in 1968 dollars. Flyaway Unit Cost 1985$: 40.000 million in 1968 dollars in 1968 dollars. Stage 1. 1 x Hyperion SSTO. Gross Mass: 450,000 kg (990,000 lb). Empty Mass: 44,000 kg (97,000 lb). Thrust (vac): 7,840.000 kN (1,762,500 lbf). Isp: 459 sec. Burn time: 300 sec. Isp(sl): 359 sec. Diameter: 10.00 m (32.00 ft). Span: 16.00 m (52.00 ft). Length: 18.00 m (59.00 ft). Propellants: Lox/LH2. No Engines: 1. Status: Study 1968. Comments: All values estimated based on drawing, statement that 5 x mass of SASSTO, payload performance, and 300 m/s sled velocity augmentation. Family: Manned spacecraft, orbital launch vehicle, Sled-Launched, SSTO. Country: USA. Launch Vehicles: Hyperion SSTO. Stages: Hyperion SSTO stage. Agency: Douglas. Bibliography: 36, 8328.